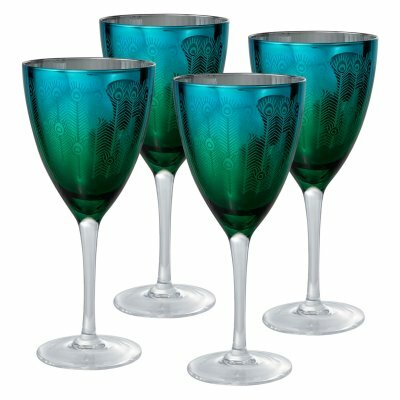 Birds of a feather will drink wine together with the Artland Inc. Peacock Wine Glasses – Set of 4. This light-hearted glassware features a beautiful blend of teal and green, highlighting a peacock feather print. These glasses, perfect for wine of all kinds, are suitable for casual, everyday use. Hand-wash. 14 ounces.